Author: Zygmunt Frajzyngier, Muhammed M. Munkaila. Series edited by: Wilhelm J.G. Möhlig, Bernd Heine. 10 pp. Roman, 92 pp. The present study examines a distinct language structure built around categories that have been ignored until recently by linguistic theories. One of these is the category point of view of the subject. The other category is goal, coding the presence of the goal of the predicate. 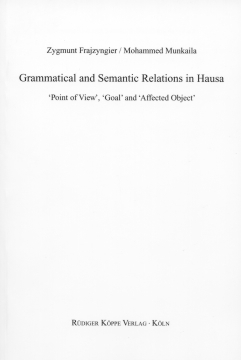 This study demonstrates that the two categories play a fundamental role in the grammar of Hausa, a West Chadic language. They determine the way arguments are coded, the form of the predicate, the semantic interpretation of the clause, and the interpretation of the semantic roles of the noun phrases occurring in the clause. The presence of the first categories has created the motivation of yet another catogory, the coding of the presence of the affected object. This study demonstrates that, in some languages the coding of the point of view takes precedence of the coding of grammatical or semantic relations. The implication of this study is that structures of various languages may be organized around different functional domains having different hierarchical structures. Frajzyngier and Munkaila's book seems to be a breakthrough in talking about grammatical and semantic relations in Hausa. Not only the terms are relabelled but also the approach towards the well-established facts concerning verbal morphology and syntax is innovative. [...] One may agree or may not agree with the proposals presented by Frajzyngier and Munkaila, but all those who are interested in Hausa or Chadic linguistic should get to know their study as it shows both semantic and grammatical relations from a different perspective. It also contributes to the claims that applying European-oriented labels such as subject, object, transitivity, etc., to any natural language, is often superimposing the relations, which do not really exist, but they force situating a given language in the structure, which is competely or hardly applicable to it. Looking for a new solution in talking about the most simple relations in the language is undoubtedly a step forward into the understanding, not only to describing, the Hausa language.